An audience has heard the story behind major organisation-wide changes at Relationships Australia SA over the past decade. 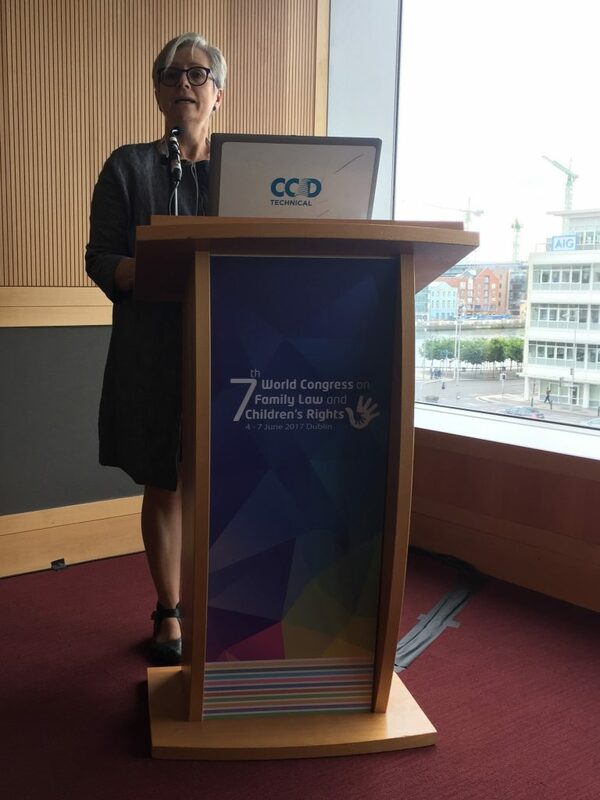 Speaking at the World Congress on Family Law and Children’s Rights in Dublin, CEO Claire Ralfs said the emergence of the Family Relationship Centres in Australia and the tragic murder of a client by her husband triggered our investigation into universal screening. “As most family law practitioners know, you only need such a tragedy to happen once in your career to be motivated to build greater safety” said Dr Ralfs. The presentation, in a meeting room with standing room only, detailed how RASA worked with Professor Jennifer McIntosh to implement the Family Law DOORS. RASA’s Principal Researcher Jamie Lee went on to explain the steps taken to overcome barriers to making universal screening a standard practice. Complemented by a poster summarising analysis of over 5,000 clients, the presentation has already generated significant interest from practitioners in the UK, Barbados, Canada, and India. Relationships Australia CEO Claire Ralfs presenting at the World Congress on Family Law and Children’s Rights in Dublin.